"La Gadoue” is one of my favorites from the album Birkin/Gainsbourg: Le Symphonique, which features orchestral versions of songs from Serge Gainsbourg's early career. Here, they're composed by Nobuyuki Nakajima, performed by the Montreal Symphony Orchestra, and sung by the iconic Jane Birkin, who–if you're unaware–was at one time Serge's collaborator and former partner. I looked up the English translation to this song's lyrics and discovered that it's about two lovers splashing about in the mud. The arrangement sounds magical! You can just imagine all the fun they're having in their rubber boots with the rain pouring down on them. Jane's girlish voice captures the delightful feeling of this moment beautifully. It’s one of those songs that makes you smile and feel nostalgic for a bygone time. I never understood what Christians meant by being "born again." The concept itself defied all logic and reason. Didn't Nature dictate that we were all once born through our mother's wombs? How, then, was it possible to be born again? 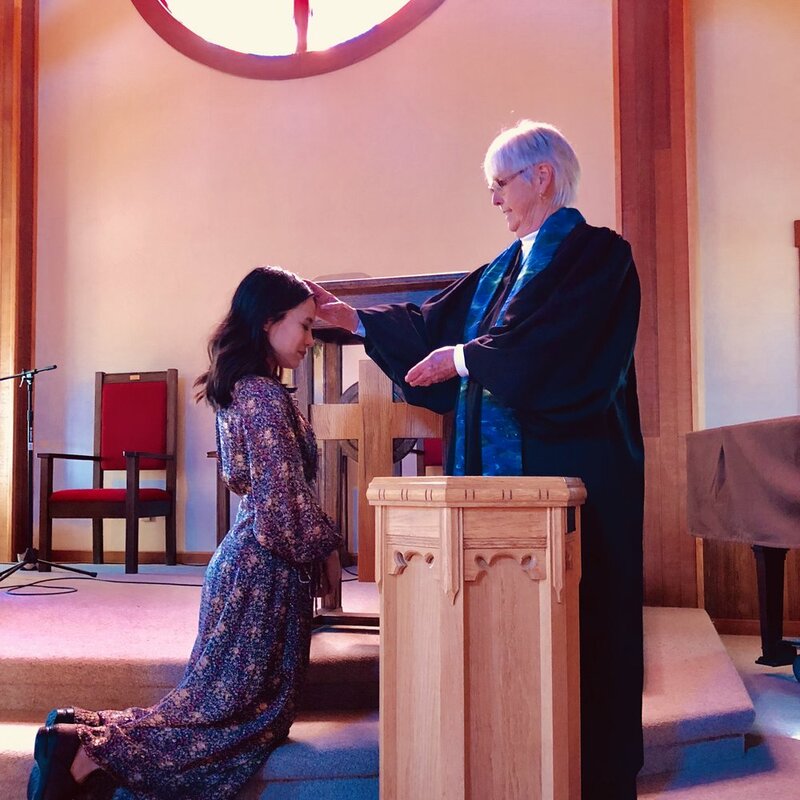 What did it mean to be "born of the Spirit"? The Spirit does indeed blow wherever it pleases. It can come upon you when you least expect it, as it did for me. You don't know where it comes from or where it's going, but when God is calling, you know it's Him. And then, when you look at your life, it starts to make more sense. Since we started making semi-annual trips to Denmark, I've been holding off on all visits to randomly researched hair salons in the States to get my hair properly cut and colored at Studio Cim Mahony. From what I learned following Emily Weiss' Instagram, she trusts her hair with only Cim Mahony himself and will fly from New York to Copenhagen just for an appointment. Now, if that's not a true testament to the man and his salon, I don't know what is! Because it’s located in an upscale apartment, being a client here is akin to visiting the chicest person you can imagine and then having that person give you VIP service. Everything here is tastefully selected, from the unusual floral arrangements down to the teacup from which you're sipping some exotic tea. It's Cim's ethos come to life. I prefer private hair salons because there's a certain level of attention provided that you can't find at the big-name salons. (In other words, it's not listed on Yelp.) There's a sense of calm and focus in this sort of environment. No crazy commotions. Your one stylist does it all, from greeting you at the door to shampooing to putting on the finishing touches. While Cim's services are privy only to an exclusive set, his team of highly trained and experienced experts are available to "everyone else". And they all seem to have the same mission: to create healthy and effortless hair that's meant to suit your face and lifestyle. 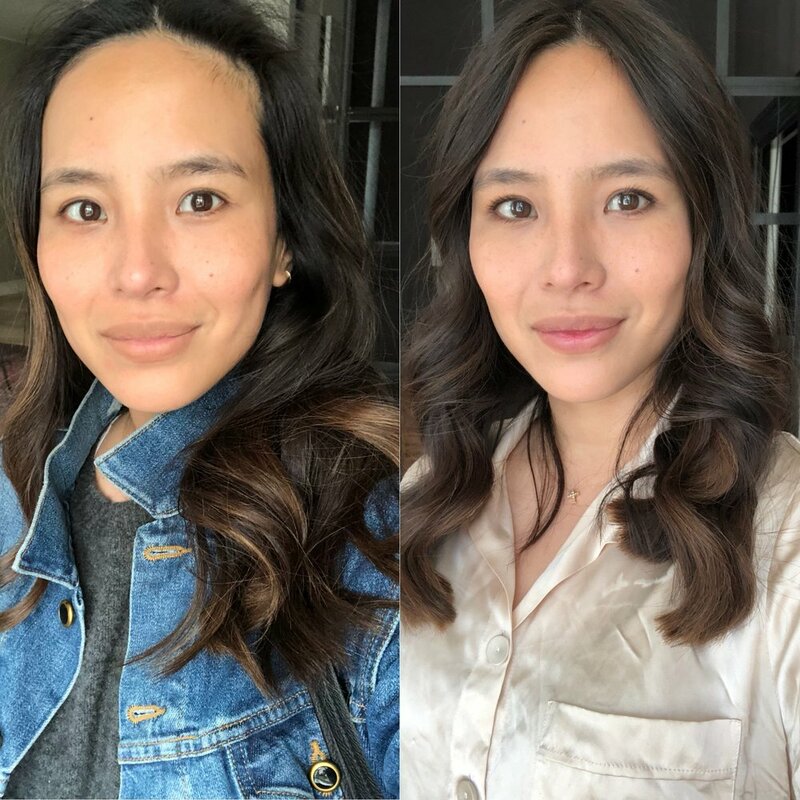 I've seen a couple of different stylists in the salon before but was particularly happy with my recent experience with Sarah Kjærsgaard Sørensen. 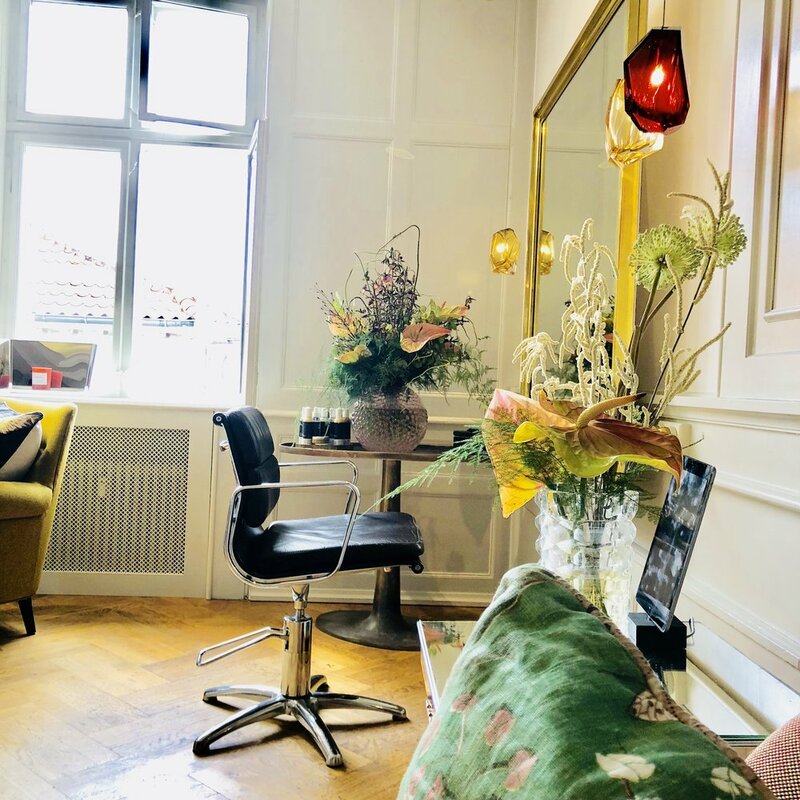 She has an anti-trendy philosophy in regards to hair, which is common amongst Danish hairdressers in general, but what I really appreciated was that she took her time to get to know my hair history and understood the difficulties I encountered in the past. European women, she explained, don't style their hair with heated tools as is done the U.S. so it's crucial to get the right cut where the mane of hair lays correctly on its own. I'd banned myself from any trims or salon visits the past seven months, so my ends were raggedy and my old highlights looked brassy. When I came in, I had about five inches of black roots showing, but my color now looks like someone flipped the light switch on from within. Sarah started by weaving in babylights (super thin highlights) throughout my hair and lifted the color two shades up from its natural base for a subtle and soft effect. Then, she gave it a blunt, one-length cut all around so that it has more of a swingy-ness to it. The whole appointment took a surprising four hours from start to finish–and, yes, it was expensive–but, considering the amount of bad haircuts I've suffered in my life, the time and financial investment is totally worth it. *I added the waves myself with ghd's Creative Curl Wand. After spending a full day perusing booths upon booths of international galleries at Art Basel last weekend, we were invited to a group dinner in the old town of Basel. The pleasant summertime temps and lingering daylight were further enjoyed by the fact that we were dining al fresco in a cobblestoned square surrounded by quaint Swiss buildings. It was, by all measures, a perfectly fine gathering. There was a mix of familiar faces as well as new–exhibitors (them) and spectators (us). The conversations ambled along in an entertaining enough manner yet marked with the expected distance of a professional tone. As the evening winded down, everyone gently indicated in their own way that it was time to return to their hotels. "I have to pack for my flight in the morning." "I've had a long week." "It was so busy today. I can't wait to go back and decompress." "Wait, let's get a nightcap after this! C'mon, we're in Basel! Let's check out the scene! Where should we go?" Cue the silent groans and grumbling heard 'round the table–all except by the perpetrator, of course. Some nights are ripe for spontaneous extensions into the wee hours of the morn; others, however, are not. The key in distinguishing between the two involves being highly attuned to the underlying vibes of the people around you. Don't be the oddball who, after a lovely dinner, insists on one more nightcap when the group is clearly ready to call it a night. (The absolute worst suggestion I've encountered is when someone desperately tried to round a group into going to a karaoke bar.) This will only lead the evening into inevitable decay. You'll find that the people to whom you said "It was nice meeting you" at the end of dinner have now become–to your dismay–the people you never ever ever want to meet again. And by this point, they're asking for your contact info. Trust me, the best thing to do is depart on the heels of the night's crescendo. Abandon any fear of missing out and leave on a high note. Preserve whatever mystery was in the air. You don’t have to become new besties with the person who sat across from you. In most cases, it's best to let the night stay young.